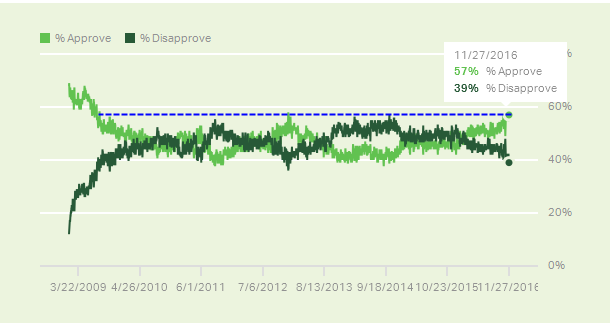 Gallup’s Daily Obama Approval Rating poll shows Americans view president Obama consistently higher now than at any time since 2009. His popularity is more of a reflection on Obama being a likable person, than having likable policies. It’s also a reflection on the extreme unpopularity of both Hillary Clinton and Donald Trump. Likable or not, Obama’s legacy will be one of complete failure. Vox reports The whole Democratic Party is now a smoking pile of rubble. Vox missed some things, lots of things actually, but the headline is accurate enough. Everything Obama stood for is about to be undone, except perhaps his drone policy which was a miserable failure and should be undone. Obama’s Affordable Care Act was nearly a complete failure. Affordable it certainly wasn’t, except for those picked up by Medicaid and a small group of heavily subsidized others. Obamacare Premiums Up 30% in TX, MS, KS; 50% in IL, AZ, PA; 93% in NM: When Does the Death Spiral Blow Up? Thousands of innocent men, women, and children have been killed by drones. Obama justified targeted killings under the pretext of wars that were never declared. US warmongers, and their backers became judge, jury, and executioner, of anyone having the required “signature”, even in countries deemed to be US allies. “Daniel Reisner, who headed the International Legal Division of the Israeli Military Advocate General’s Office from 1994 to 2005, has stated that although targeted killing is illegal under previous understanding of international law, “If you do something for long enough, the world will accept it. The whole of international law is now based on the notion that an act that is forbidden today becomes permissible if executed by enough countries.” Reisner continues, “International law progresses through violations. We invented the targeted assassination thesis and we had to push it. Obama pushed hard for the Transpacific Trade Partnership (TPP) with Asia, and Transatlantic Trade and Investment Partnership (TTIP) with the EU. Both are dead. Both deserved to fail actually because they were loaded with global warming silliness and provisions that allowed companies to sue governments. 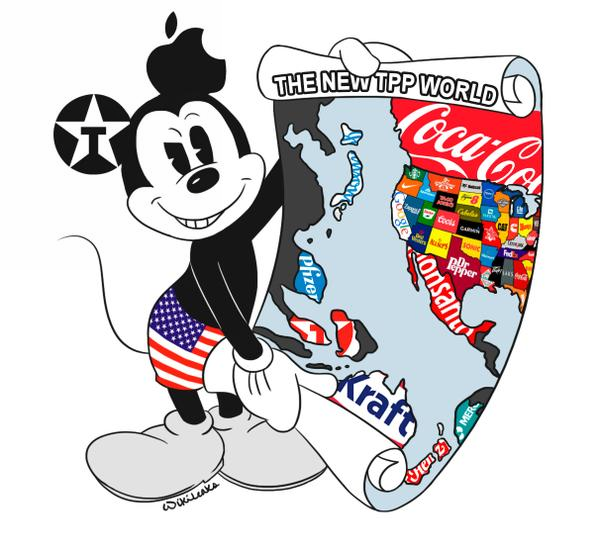 I wrote about the collapse of TTIP on September 23 in US-EU Trade Talks “De Facto Dead”. On November 16 I wrote Australia Snubs Obama, Dumps TPP, Opts for China-Sponsored Trade Deal: Mish Proposed Deal. In 2009, U.S. President Barack Obama gave orders for the detention camp to be closed by January 22, 2010. As of 2015, the detention camp remains open due to a congressional refusal of funds for its closure. Rather than, or in addition to ramming Obamacare trough a budget Reconciliation Act, Democrats could have had the decency to get funding for closing Guantanamo. Hillary the Hawk: A History From Haiti to Syria, the Democratic candidate’s long record suggests she’s looking forward to being a war president on day one. Her policies in Haiti, Iraq, Pakistan, Afghanistan, Libya, and Syria were all pro-war. It’s no wonder Wall Street and the banks loved her. Please watch that video. It’s very short, about 12 seconds. In the wake of that assassination, Libya is now in Civil War. Parts of Libya are under control of terrorists including ISIS. Obama embraced and extended the blatantly illegal spy tactics of the Bush administration. We learned about those tactics thanks to global Edward Snowden. Two days ago, I provided a wrap-up discussion and stated Pardon Snowden, Prosecute Clapper. It seems unlikely. Obama is too big of a coward, and too much like Bush to pardon Snowden. Obama’s policy towards Russia has been a complete failure. Trump rates to be more pragmatic. Did Obama Do Anything Right? Inquiring minds may be wondering if Obama did anything right in eight years. I can actually point to one thing: Talks with Iran were a success. Some will disagree. Unfortunately, Trump may undo Obama’s success on this front, but rates to be better in regards to Russia, and hopefully NATO. Obama’s legacy is one of at least seven major failures. His one success, which some debate, may be undone. Ultimately, that’s his scorecard, no matter what his popularity may be at the moment.